Yes, it is cloudy and raining this week, and the media has been reporting a glut of stories about cloud computing already. But the IBM Center has released a new report “Moving to the Cloud: An Introduction to Cloud Computing in Government” that is targeted to executives, not technologists. The buzz in the technology world around cloud computing is almost deafening, but for good reason. The report lays out the many reasons for its use, including economies of scale, better collaboration, and usage-based pricing (you pay only for what you use, like electricity). For example, a school district in Tennessee established a private cloud and was able to cut its IT support costs by 60 percent. These kind of savings catch people’s eyes. 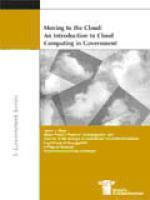 The author, Dr. David Wyld of Southeastern Louisiana University, notes that “Cloud computing is an emerging concept. It has many names, including: grid computing, utility computing, and on-demand computing. Indeed, one of the hindrances . . . is the lack of understanding of what it is—and isn’t. . . “ He relies on the definition developed by the National Institute of Standards and Technology, which lays out the essential characteristics of cloud computing: on-demand self-service, ubiquitous network access, locaction-independent resource pooling, rapid elasticity, and measured service. While still a geeky definition, more importantly, Wyld points to the fact that we’ve all used cloud computing already – Gmail, YouTube, GoogleDocs, Flickr, and Ning are all common examples in the commercial world. And Wyld says over 4,000 universities have converted their email systems to cloud computing as well. But government has been a bit more cautious in its adoption. Wyld gives examples of the use of cloud in government, lays out ten challenges to public managers in the use of cloud computing (like security and interoperability), and offers some predictions on the road ahead. He also offers links to some useful video primers, like the one from the UK’s Computing Magazine as well as the one from GSA’s Apps.gov. A key takeaway for government managers: cloud computing has potential to transform government IT but it won’t be a silver bullet. It will most likely be more useful for mission support services such as e-mail, web servers, data storage, and for common cross-government services such as accounting, procurement, and collaboration tools. But agencies will likely be more cautious in using it for core mission business applications such as the Social Security payroll reporting system or the air traffic control routing system.